Bu makale, anneye-babaya ait sosyalleştirme uygulamaları ile çocuklarda ve ergenlerde sosyal yanlı davranışlar arasındaki ilişkileri ele almaktadır. Teorisyenler ve araştırmacılar anne-baba desteğinin, sevgisinin, sıcaklığının ya da duyarlılığının sosyalleşme süreçlerini olumlu olarak etkilediğini ileri sürmektedir. Çocuklar, destekleyici, sıcak, duyarlı ve demokratik bir aile çevresinde anneye-babaya ait sosyalleştirme mesajlarına dikkat edebilmekte ve bu mesajları önemseyebilmektedir. Demokratik tutum ve davranışlar gösteren anneler-babalar, beklenen ve istenen davranışları kazandırmak için çocukları kontrol etmekte, tümevarımsal akıl yürütme ve açıklamalar yoluyla onların eylemlerinin yararlı ve zararlı sonuçlarına işaret ederek çocuklarda empatiyi, perspektif almayı ve sempatiyi teşvik etmektedir. Çocuklar ve ergenler, diğerinin perspektifini gördüğünde ve daha çok başkası için empatiyi, suçluluğu ve sempatiyi yaşadığında sosyal yanlı ahlaki akıl yürütmeyi kullanabilmekte ve sosyal yanlı davranışlar gösterebilmektedir. This article addresses the relations between parental socialization practices and prosocial behaviors in children and adolescents. Theorists and researchers have suggested that parental support, affection, warmth or responsiveness influences positively socialization processes. Children may attend to and care more about the parental socialization messages in a supportive, warm, responsive and democratic family environment. Parents who exhibit democratic attitudes and behaviors exert control in order to attain expected and desired behaviors for their children. They can induce empathy, perspective-taking and sympathy in their children by pointing out the beneficial or harmful consequences of their actions through inductive reasoning and explanations. Children and adolescents can use prosocial moral reasoning and display prosocial behaviors when they see perspectives of others and experience empathy, guilt and sympathy more vicariously. Ainsworth, M. D. S. ve Bowlby, J. (1991). An ethological approach to personality development, American Psychological Association, 46, 333-341. Arzeen, S., Hassan, B. ve Riaz, M. N. (2012). Perception of parental acceptance and rejection in emotionally empathic and non-empathic adolescents. Pakistan Jo-urnal of Social and Clinical Psychology, 2, 60-69. Barnett, M. A., Quackenbush, S. W. ve Sinisi, C. S. (1996). Factors affecting child-ren’s, adolescents’, and young adults’ perceptions of parental discipline, Jour-nal of Genetic Psychology, 157(4), 411-424. Batson, C. D. (1991). The Altruism Question: Toward a Socialpsychological Answer. Hillsdale, NJ: Erlbaum. Baumrind, D. (1991). The influence of parenting style on adolescent competence and substance use. Journal of Early Adolescence, 11, 56-95. Bayraktar, F., Sayıl, M. ve Kumru, A. (2009). Liseli ergenler ve üniversiteli gençlerde benlik saygısı: Ebeveyn ve akrana bağlanma, empati ve psikolojik uyum değişkenlerinin rolü. Türk Psikoloji Dergisi, 24 (63), 48-63. Bryant, B. K. (1982). An index of empathy for children and adolescents. Child Development, 53, 413- 425. Bugental, D. B. ve Grusec, J. E. (2006). Socialization processes. In Eisenberg, N. (Ed. ), Handbook of Child Psychology. Social, Emotional, and Personality De-velopment. New York: Wiley. pp. 366- 428. Carlo, G., Knight, G. P., McGinley, M. ve Hayes, R. (2011). The roles of parental inductions, moral emotions, and moral cognitions in prosocial tendencies among Mexican American and European American early adolescents. Journal of Early Adolescence, 31, 757-781. Clary, E. G. ve Miller, J. (1986). Socialization and situational influences on sustained altruism. Child Development, 57, 1358-1369. Davidov, M. ve Grusec, J. E. (2006). Untangling the links of parental responsiveness to distress and warmth to child outcomes. Child Development, 77, 44-58.
de Vignemont, F. ve Singer, T. (2006). The empathic brain: How, when and why? Trends in Cognitive Sciences, 10, 435-441.
de Waal, F. B. M. (2008). Putting the altruism back into altruism: The evolution of empathy. Annual Review of Psychology, 59, 279-300. Dunn, J., Cutting, A. ve Demetriou, H. (2000). Moral sensibility, understanding others, and children’s friendship interactions in the preschool period. British Journal of Developmental Psychology, 18, 159-177. Eisenberg, N. ve Mussen, P. (1989). The Roots of Prosocial Behavior in Children. Cambridge, England: Cambridge University Press. Eisenberg, N., Carlo, G., Murphy, B. ve Van Court, P. (1995). Prosocial development in late adolescence: A longitudinal study. Child Development, 66, 911-936. Eisenberg, N. ve Murphy, B. (1995). Parenting and children’s moral development. In Bornstein, M. H. (Ed. ), Handbook of Parenting. Mahwah, NJ: Erlbaum. pp. 227-257. Eisenberg, N. ve Fabes, R. A. (1998). Prosocial Development. In Eisenberg, N. ve Damon, W. (Eds. ), Handbook of Child Psychology. Social, Emotional, and Personality Development. New York: Wiley. pp. 701-778. Eisenberg, N., Cumberland, A., Guthrie, I. K., Murphy, B. C. ve Shepard, S. A. (2005). Age changes in prosocial responding and moral reasoning in adoles-cence and early adulthood. Journal of Research on Adolescence, 15, 235-260. Eisenberg, N., Fabes, R. A. ve Spinrad, T. L. (2006). Prosocial development. In Damon, W., Lerner, R. M. ve Eisenberg, N. (Eds. ), Handbook of child psycho-logy. Social, emotional, and personality development. New York: Wiley. pp. 646-718. Feldman, R. (2007). Mother-infant synchrony and the development of moral orientation in childhood and adolescence: Direct and indirect mechanisms of developmental Continuity. American Journal of Orthopsychiatry, 77, 582-597. Grusec, J. E. ve Goodnow, J. J. (1994). Impact of parental discipline methods on the child’s internalization of values: A reconceptualization of current points of vi-ew. Developmental Psychology, 30, 4-19. Hardy, S., Bhattacharjee, A., Aquino, K. ve A. Reed, A. (2010a). Moral identity and psychological distance: The case of adolescent parental socialization. Journal of Adolescence, 33, 111-123. Hardy, S. A., Carlo, G. ve Roesch, S. C. (2010). Links between adolescents’ expec-ted parental reactions and prosocial behavioral tendencies: The mediating role of prosocial values. Journal of Youth and Adolescence, 39, 84-95. Hastings, P. D., Zahn-Waxler, C., Robinson, J., Usher, B. ve Bridges, D. (2000). The development of concern for others in children with behavior problems. Developmental Psychology, 36, 531-546. Hastings, P. D., Utendale, W. T. ve Sullivan, C. (2007). The socialization of prosocial development. In Grusec, J. E. ve Hastings, P. D. (Eds. ), Handbook of Socializa-tion: Theory and Research. New York: Guilford Press. pp. 638-659. Haque, A. (1987). Social class differences in perceived maternal acceptance-rejection and personality disposition among Pakistani children. In Kağıtçıbaşı, Ç. (Ed. ), Proceedings of the Eight International Conference on Growth and Progress in cross Cultural Psychology. Istanbul Turkey: Swets North America Inc research. Islamabad: Curriculum Wing Federal Education Ministry. pp. 189-195. Hoffman, M. L. (1980). Moral development in adolescence. In Adelson, J. (Ed. ), Handbook of Adolescent Psychology. New York: John Wiley and Sons. pp. 295-343. Hoffman, M. L. (1983). Affective and cognitive processes in moral internalization. In Higgins, E. T., Ruble, D. N. ve Hartup, W. W. (Eds. ), Social Cognition and Development: A Sociocultural Perspective. Cambridge, England: Cambridge University Press. pp. 236-274. Hoffman, M. L. (2000). Empathy and Moral Development: Implications for Caring and Justice. Cambridge, United Kingdom: Cambridge University Press. Janssens, J. M. A. M. ve Gerris, J. R. M. (1992). Child rearing, empathy, and proso-cial development. In Janssens, J. M. A. M. & Gerris, J. R.M. (Eds. ), Child Re-aring: Influence on Prosocial and Moral development. Amsterdam: Swets and Zeitlinger. pp. 57-75. Janssens, J. M. A. M. ve Dekovic, M. (1997). Child rearing, prosocial moral reaso-ning, and prosocial behaviour. lnternational Journal of Behavioral Develop-ment, 20, 509-527. Kağıtçıbaşı, Ç. ve Ataca, B. (2005). Value of children and family change: A three-decade portrait from Turkey. Applied Psychology: An International Review, 54 (3), 317-337. Kestenbaum, R., Farber, E. A. ve Sroufe, L. A. (1989). Individual differences in empathy among preschoolers: Relation to attachment history. New Directions for Child Development, 44, 51-64. Kındap, Y., Kumru, A. ve Bayraktar, F. (2006, May). The association between pa-renting and ındividual/social outcomes in Turkish early adolescents. Xth EARA Conference, Antalya, Turkey. Kochanska, G. ve Murray, K. T. (2000). Mother-child mutually responsive orien-tation and conscience development: From toddler to early school age. Child Development, 71, 417-431. Kochanska, G., Forman, D. R., Aksan, N. ve Dunbar, S. B. (2005). Pathways to conscience: Early mother-child mutually responsive orientation and children’s moral emotion, conduct and cognition. Journal of Child Psychology and Psyc-hiatry, 46, 19-34. Krevans, J. ve Gibbs, J. C. (1996). Parents’ use of inductive discipline: Relations to children’s empathy and prosocial behavior. Child Development, 67, 3263-3277. Laible, D. J. ve Thompson, R. A. (2000). Mother-child discourse, attachment secu-rity, shared positive affect, and early conscience development. Child Develop-ment, 71, 1424-1440. Lamborn, S., Mounts, N. S., Steinberg, L. ve Dornbusch, S. M. (1991). Patterns of competence and adjustment among adolescents from authoritative, authorita-rian, indulgent, and neglectful families. Child Development, 62, 1049-1065. Lange, A., Blonk, R. ve Wiers, R. W. (1998). Assessment: The parent-child interac-tionnaire, PACHIQ. Clinical Psychology and Psychoterapy, 5, 187-198. Malti, T., Gummerum, M., Keller, M. ve Buchmann, M. (2009). Children’s moral motivation, sympathy, and prosocial behavior. Child Development 80, 442-460. Maccoby, E. E. ve Martin, J. A. (1983). Socialization in the context of the family: Parent-child interaction. In Mussen, P. H. ve Hetherington, E. M. (Eds. ), Handbook of Child Psychology: Socialization, Personality, and Social Deve-lopment. New York: Wiley. pp. 1-101. Miller, P. A., Eisenberg, N., Fabes, R. A. ve Shell, R. (1996). Relations of moral reasoning and vicarious emotion to young children's prosocial behavior toward peers and adults. American Psychological Association, 32, 210-219. Moreno, A., Klute, M. ve Robinson, J. (2008). Relational and individual resources as predictors of empathy in early childhood. Social Development, 17 (3), 613-637. Padilla-Walker, L. M. ve Carlo, G. (2004). It’s not fair! Adolescents’ constructions of appropriateness of parental reactions to antisocial and prosocial situations. Journal of Youth and Adolescence, 33, 389–401. Padilla-Walker, L. M. (2008). My mom makes me so angry! Adolescent perceptions of mother-child interactions as correlates of adolescent emotions. Social Deve-lopment, 17 (2), 306-325. Penner, L. A. ve Finkelstein, M. A. (1998). Dispositional and structural determinants of volunteerism. Journal of Personality and Social Psychology, 74, 525-537. Pratt, M. W., Hunsberger, B., Pancer, S. M. ve Alisat, S. (2003). A longitudinal analysis of personal values socialization: Correlates of a moral self-ideal in late adolescence. Social Development, 12, 563-585. Sheikh, H. ve Haque, A. (1994). Perceived paternal acceptance-rejection and perso-nality dispositions of girls students of high socioeconomic status reared up in different environment setting. Proceedings of the ninth international conference Pakistan psychological association. Role of Psychologist in the New Social Order Lahore: APA IIIyas. Shen, Y., Carlo, G. ve Knight, G. P. (2013). Relations between parental discipline, empathy- related traits, and prosocial moral reasoning: A multicultural exami-nation. Journal of Early Adolescence, 33, 994-1021. Strayer, J. (2004). Children's anger, emotional expressiveness, and empathy: Relati-ons with parents’ empathy, emotional expressiveness, and parenting practices. Social Development, 13 (2), 229-254. Sunar, D. ve Fişek, G. (2005). Contemporary Turkish families. In Gielen, U. & Roopnarine, J. (Eds. ), Families in Global Perspective. Allyn ve Bacon/Pearson. pp.169-183. Waters, E., Hay, D. ve Richters, J. (1986). Infant-parent attachment and the origins of prosocial and antisocial behavior. In Olweus, D., Block, J. ve Radke-Yarrow, M. (Eds. ), Development of Antisocial and Prosocial Behavior: Research, Theories, and Issues. Orlando, FL: Academic Press. pp. 97-125. Waters, E., Kondo-Ikemura, K., Posada, G. ve Richters, J. E. (1990). Learning to love: Mechanisms and milestones. In Gunnar, M. ve Sroufe, L. A. (Eds. ), Min-nesota Symposia on Child Psychology. Hillsdale, NJ: Lawrence Erlbaum. pp. 217-255. Yağmurlu, B., Çıtlak, B., Dost, A. ve Leyendecker, B. (2009). Türk annelerin çocuk sosyalleştirme hedeflerinde eğitime bağlı olarak gözlemlenen farklılıklar. Türk Psikoloji Dergisi, 24 (63), 1-15. Zahn-Waxler, C., Radke-Yarrow, M. ve King, R. (1979). Child rearing and children’s prosocial initiations toward victims of distress. Child Development, 50, 319-330. Zahn-Waxler, C., Radke-Yarrow, M., Wagner, E. ve Chapman, M. (1992a). Deve-lopment of concern for others. Developmental Psychology, 28, 126-136. Zhou, Q., Eisenberg, N., Losoya, S. H., Fabes, R. A., Reiser, M., Guthrie, I. K., Murphy, B. C., Cumberland, A. J. ve Shepard, S. A. (2002). The relations of parental warmth and positive expressiveness to children’ empathy-related res-ponding and social functioning: A longitudinal study. Child Development, 73, 893-915. ISNAD ŞENGÖNÜL, Turhan . "Annelerin-Babaların Çocuklarda ve Ergenlerde Sosyal Yanlı Gelişme İle İlişkili Sosyalleştirme Süreçlerine Etkisi". 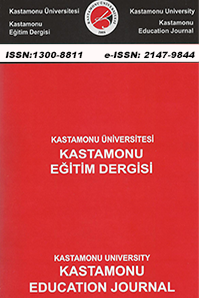 Kastamonu Eğitim Dergisi 25 / 2 (March 2017): 643-658.